If you are looking for a modern designed vanity with traditional aesthetics, look no further than the Acclaim 72-inch Vanity in White. This solid oak vanity includes brushed chrome hardware and a White Carrara marble counter top, porcelain sinks and soft close hinges and drawer glides. Daria 80 inch Double Vanity in White, White Carrara Marble Top, Square Sinks, No Mirror The beautiful Daria collection vanities stand out in any bathroom with strong, clean lines, raised panels and elegant counters with square sinks. There's plenty of cabinet space, the fully extending drawers are dovetail construction, and chrome detailing completes the look. Daria vanities deftly combine the function of today with a nod to the elegance of the past. It's the new modern classic styling with a contemporary twist. 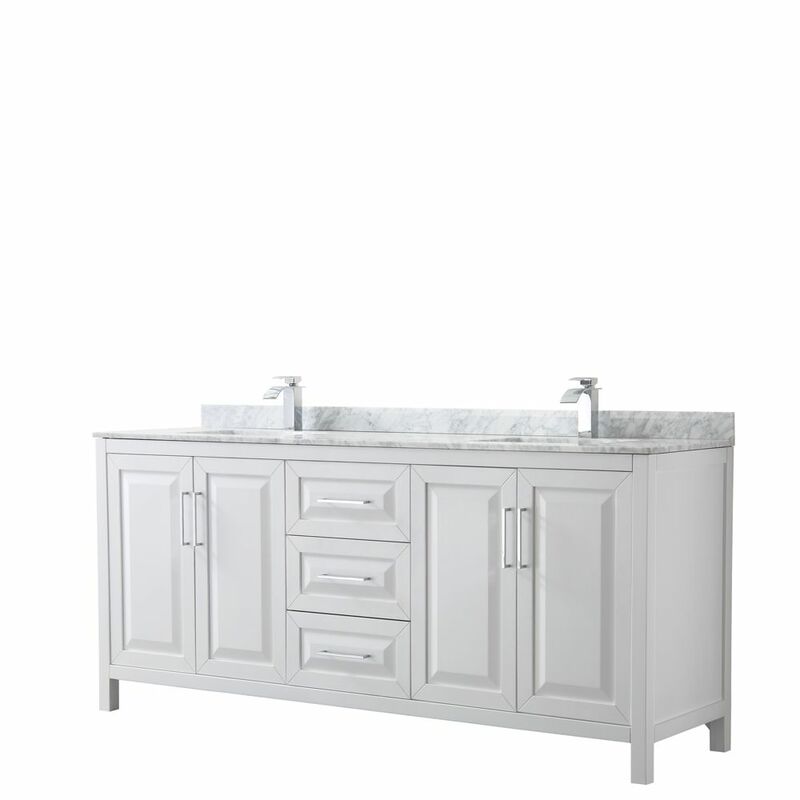 Daria 80 inch Double Vanity in White, White Carrara Marble Top, Square Sinks, No Mirror is rated 5.0 out of 5 by 2. Rated 5 out of 5 by selftaughthandyman from fabulous product, well designed and made. Everything was made ready to go. Minimum assembly was n... fabulous product, well designed and made. Everything was made ready to go. Minimum assembly was needed. Would definitely buy again if more space available. Rated 5 out of 5 by Beas from Well built and beautiful vanity. Very happy with purchase!... Well built and beautiful vanity. Very happy with purchase!